RAMNAGAR ROAD NO. 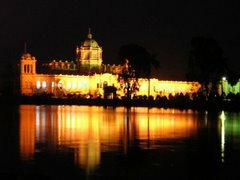 3, AGARTALA, TRIPURA PIN - 799002. Y To generate mass awareness about Hepatitis in general and Hepat tis B & C in particular . Y To explain the preventive & Protective aspect of the disease in siplest manner to all concerned. Y Mass immunization against Hepatitis B.
Y Expansion of activities by opening Hepatitis Clinic up to the peipheral level. Y To take active initiative for research on Hepatitis in Tripura. Y To bring Hepatitis B vaccination under the perview of National immunization Programme. Y To provide counseling services to the patient of Hepatitis and their relatives. Y Screening of family members of Hepatitis B.
Y To provide necessary treatment to the patient of Hepatitis. Y To create a Hepatitis Registry in the State. Y To participate in various Health related programme. Y To extend the activities in different sphere of Health Care delivery system. only thing that ever has’’. The Hepatitis Foudation of Tripura was born on 28th July 2002 with dedicated citizens of almost every profession such as doctor, engineer, businessman, media personnel, medical representatives, nursing staff, paramedical workers, medical laboratory personnel, health personnel, politicians, high officials, bankers, social workers, students & many others.The Hepatitis Foundation of Tripura was formed at the time when the medical fraternity in Tripura was unaware of gravity of the disease hepatitis specially B & C in the state. It was well known fact that hepatitis B & C are many many times contagious than much talked disease of civilization -HIV. While International & National NGOs, central & state governments, media, social organization, whole of medical fraternity & even WHO are actively involved in mass awareness programme for HIV /AIDS disease & spending million for the same cause, remain silent for silent killer disease hepatitis. At this juncture some greedy pharmaceutical companies along with some pseudo social workers, organizations start vaccination against hepatitis B at highest cost possible without any sort of briefing or counseling about the disease. These so-called social workers looted people of Tripura at the cost of their unawareness & unknown fear of the disease. There was no scientific criteria or protocol followed for health beneficiaries before immunization. The Health Department of State Government did not have any control over them. 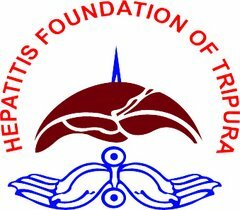 At this juncture ‘‘Hepatitis Foundation of Tripura’’ emerged. The begining days were not very smooth.Common belive that every so called ‘‘ Social Organisation’’ has got another face, also endangered our mere existence. The people & the govt. started weighing us in the same standard but soon we could proof ourselves and our vision, mission, target and action become clear to everybody. Our first success come in the form of ‘‘stopping’’-unscrupulous use of Hepatitis-B vaccine by money mangers. 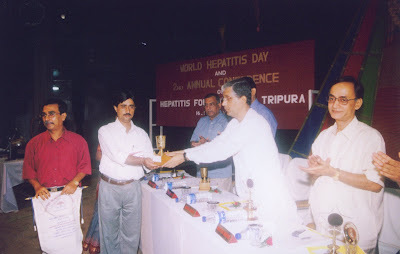 On 15 th December'02-our first Hepatitis Clinic started functioning at ‘‘Agartala Press Club’’ with the active support of Journalist friends. In March'o3 new Govt. took oath and new Heath Minister Shri Tapan Chakraborty gave us a patience hearing and Dept. of Health permited us to work in Govt. Hospitals by running Hepatitis Clinic on every Sunday using MCH centre of the Govt. Hospitals. The first offical ‘Hepatitis Clinic’ was inaugurated by Health Minister Shri Tapan Chakraborty at T.S. Hospital ,Udaipur on Doctor's Day i.e lst July'03 and on 6th July '03 Hepatitis Clinic of Agartala was shifed to IGM Hospital. 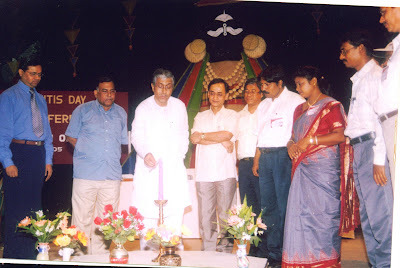 On July 27th ‘03 Health Minister Shri Tapan Chakraborty inaugurated Hepatitis clinic at RGM Hospital, Kailasahar and Sub-Divisional Hospital, Dharmanagar. And since then people from every corner of state started requesting to open ‘Hepatitis Clinic’ in their respective Hospitals. Working hand in hand with Dept. of Health, Govt. 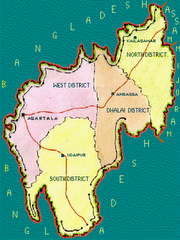 of Tripura, Foundation started expanding its area of activity from one corner of state to other i.e kanchanpur to Sonamura to Sabroom. Today Foundation has branches 19 throughout the state but expansion program is continuously & corstantly progressing. Foundation members are working together in a unique blend of unity towards a common goal prevention & protection against hepatitis among those not affected by the disease & improving quality of life for all those affected by disease. We are gradually reaching out to the people of Tripura through our weekly (every Sunday) hepatitis clinic in all most all subdivisions in spite of some geographically difficult places. The members including doctors are providing the necessary help to the beneficiaries in the hepatitis clinics. The members conduct hepatitis awareness programme by giving health talk in health camps, community gatherings, health personnel worshops & meetings, school & college health awareness programmes, by distributing disease information leaflets in local languages, by banner writing, by permanent board writings in public places & health centers, through local cable network, by participating in health fairs, by conducting quiz competition & essay writing competition among school & college students, publishing informative articles in local languages in local daily, by health talks & discussion in TV, radio & many other ways. We get enormous support from electronic and print medias. 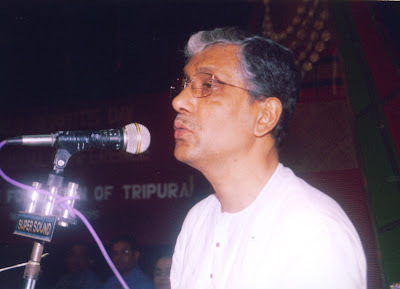 The source of inspiration and enthusiasm of every member of Hepatitis Foundation of Tripura through out the state is our Hon’ble Chief Minister Sri Manik Sarkar, who always spare his valuable time by his presence in our programme and by giving advice and guidance to our members as and when we are in need. 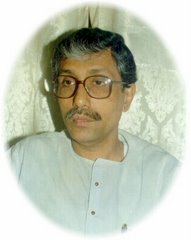 Our Friend, Philosopher and guide is our beloved Health Minister Sri Tapan Chakraborty. He who regularly & constantly enquires about our activities and performance and continuously asking us to remain honest and dedicated to the people of Tripura. Each & every member of council of ministers the State of Tripura always remains abreast & informed about the functioning of the foundation and always helping the organisation by the continuous patronage. Elected members of three tier panchayat of the state are continuously encouraging the foundation in each of every tiers starting from Zillasabhadhipati to member of Panchayat & Nagar Panchayat. The help extended by the Commissioner of Health Shri S.K.Roy, IAS is examplary . Director of Health Services, Director of family welfare and Department of Health as a whole and health care providers of every nook & corner of State are the activist of our struggle against hepatitis. Definitely every member of the Foundation are the corner stone of the organisation. But this is people of Tripura who are the real tower of the strength of the foundation. 1. Development of Mass awareness throughout the state about Hepatitis. 2. Immunisation against Hepatitis B at a highly subsidised rate. 3. Counselling of Hepatitis Patient & their family members, free of cost. 4. Investigation of Hepatitis at a subsicbised rate from our empaseled lass throught state. 5. Advice & suggestion regarding treatment of Hepatitis, free of cost. 7. To organise General/Specialist Health Camp at different places of the state to reach to the people who are in need. (c) Diagnesis Counselling Treatment advice against Hepatitis. 2. Organising awareness camp at interior places/Health centres. 3. Organising awareness camp at Schools & Colleges (as permitted by Dept. of Education, Govt. 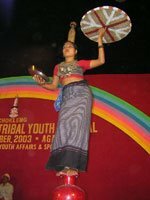 of Tripura). 4. Awareness campaign at Health Institutions among Health Care Providers. 5. Awareness campaign among TSR jawans & other police and paramillitary forces. 6. General & Specialist Health Camp at various places of state. 7. Publication of book, booklet, leaflet etc. for awareness. 8. Publication of bi-monthly Newsletter from Aug’06. 9. Observation of World Hepatitis Day on July 16th every year. 10. Organising seminar on hepatitis/ Health related matters. 11. Organising Super Specialist Health Camp for treatment of Hepatitis B & C. / Other diseases. 12. Awareness through print & electronic media. 13. Release of audio & video cassettes & CDs. 14. Organising Quiz competition/Eassy Writing competition/sit & draw competition for students & develop mass awareness. 15. Participating in all Govt. program including ''Health Fair'' to propagate Health awareness. 16. Working with other professional & Health related organ fisation. Hepatitis Foundation of Tripura targeted 35 lacs population of tiny beautiful Tripura, inspite of many odds we will go ahead to meet our future plans. 1. Expansion of activities of hepatitis Foundation of Tripura in every corner of state. 2. Research works & Projects on Hepatitis in Tripura. 3. To include Immunisation against Hepatitis B under Universal Immunisation Program (UIP)Expanded program of Imunisation (EPI). 4. Inclusion of hepatitis control programme in National Health Policy. 5. To make compulsory immunization against hepatitis B for all health care providers before joining service, and professional education like Medical, Nursing, Paramedical etc. 6. 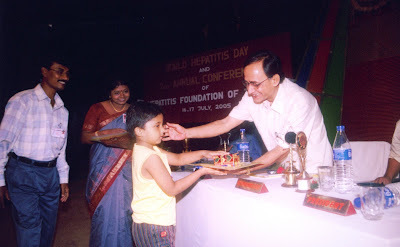 To make compulsory immunization against hepatitis B for all children before joining schools. 7. Compulsory Screening of all pregnant mothers for hepatitiis B. 8. Preoperative screening for Hepatitis B. 9. A Hospital for Liver (Patients)diseases. 10. A Permanent office of Hepatitis Foundation of Tripura at Agartala. As our foundation is a non-profit organization, we depend on the help of our well wishers. We get generous support from pharmaceutical companies, druggist & chemist, social workers, donors, businessmen, various corporate houses, Govt. 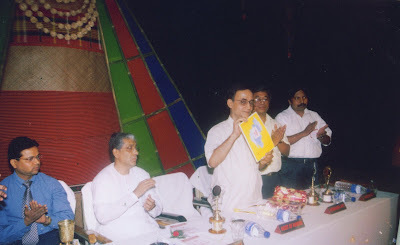 undertakings, Industries, Doctors, Advertisers & Politicians to run our foundation's activities through out Tripura. Hepatitis foundation of Tripura is now becoming stronger & stronger with active cooperation of all members throughout the state. At present we are having 21 branches throughout the state and our target is very high and we strongly believe that by the end of 2007, presence of Hepatitis Foundation Of Tripura will be felt in every corner of the state. All the branches are supervised by the 15 member Executive Comittee from its temporary office at Hotel Royal Guest House, Palace compound (West), Agartala. Activities of every branch are supervised by 11 member branch comittee. Every branch organises Annual conference in the month of April & May. The state conference is being organised in the month of June or July every year. 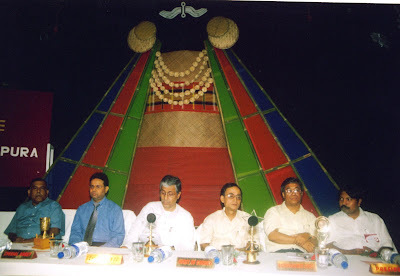 The III Annual Conference was organised on 16th July 2006 at Agartala & IV Annual congace at Udaipur an 30th June & 1st July 2007. We publish yearly souvenir ''Hepa Care'' - during our state Annual Conference. We have started publishing bimonthly News Letter from Aug'06 for free circulation. Inaugurated of 30th june 2007 at 4th annual state conference held at Udaipur. Any individual who pledges to our objects and have a sense of social responsibility and ready to work selflessly can be the member of Hepatitis Foundation of Tripura.